"Hillary and I have fundamental differences," Sanders said. Senator and 2020 presidential candidate Bernie Sanders said that he is not interested in taking advice from Hillary Clinton on his presidential bid Friday on ABC's "The View". The Vermont senator's comments come days before he is scheduled to appear in Selma at a Martin and Coretta King Unity Breakfast during which the former secretary of state and 2016 Democratic presidential nominee will be honored and is expected to attend. 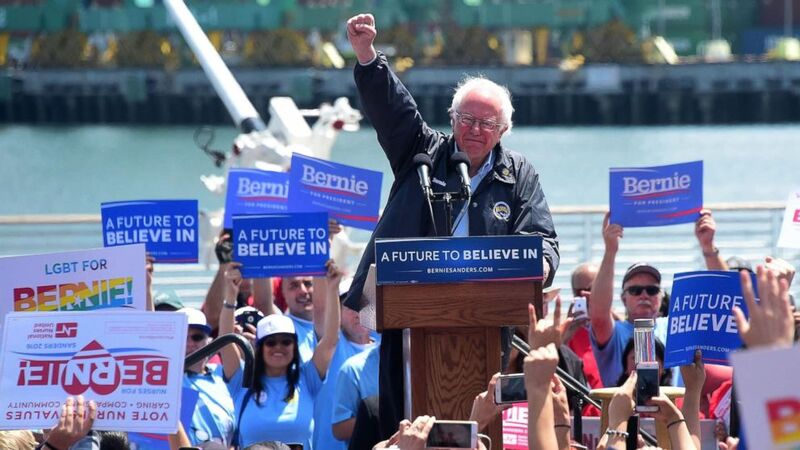 The Sunday breakfast is set to commemorate the civil rights march, dubbed "Bloody Sunday" when civil-rights demonstrators were beaten and tear-gassed by police on the Edmund Pettus Bridge in Selma, Ala.
(Frederic J. Brown/AFP/Getty Images, FILE) Democratic Party candidate Bernie Sanders speaks to supporters, May 27, 2016, in Los Angeles. Two other presidential candidates, Sen. Sherrod Brown and former U.S. Secretary of the U.S. Department of Housing and Urban Development Julian Castro, will also be in attendance at the King Unity Breakfast. Sanders also spoke about creating an unprecedented grassroots campaign and that he already has 1 million volunteers ready to help his campaign. Sanders raised $6 million in donations just 24 hours after announcing his 2020 presidential bid earlier this month. "It'll be stronger, it will be involving more people, it will be more diverse," Sanders said. Sanders slammed President Donald Trump in his interview with ABC's The View saying that he is the "most dangerous president in modern American history." He also attacked Trump on his stance on climate change and said that he is embarrassed that the President won't acknowledge the issue. Sanders said the time is now to immediately grasp the magnitude of climate change and transform the energy system in the United States. "You can't go too far on the issue of climate change," Sanders said. "The future of the planet is at stake." In late-January, an ABC News/Washington Post poll showed Sanders finishing third with 4 percent, behind Biden and Sen. Kamala Harris, D-Calif. The poll asked an open-ended query for Democrats about their 2020 support, without a response-prompting candidate list.